Files with APF extension might also be profiles from ESRI ArcPad mobile mapping software. The APF file extension is also used by ESRI ArcPad for its profile file format. 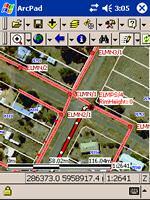 ArcPad is a professional mobile field mapping and data collection software. Profile store information and settings about the user. ArcPad is GIS software for Windows Mobile operating system. ArcPad provides field-based personnel with the ability to capture, analyze, and display geographic information. Click on the software link for more information about ArcPad. ArcPad uses apf file type for its internal purposes and/or also by different way than common edit or open file actions (eg. to install/execute/support an application itself, to store application or user data, configure program etc. ).